Heraklion passenger and car ferry ticket prices, timetables, ticket reservations and information for ferries sailing from Heraklion to Ios, Mykonos, Paros, Piraeus and Santorini. Compare all available Heraklion ferry ticket prices in real time and book the cheapest available Heraklion car and passenger ferry tickets sailing to and from Heraklion, Ios, Mykonos, Paros, Piraeus and Santorini with Hellenic Seaways, ANEK Superfast, Minoan Lines or Sea Jets ferries online with instant confirmation. Book Heraklion Ferry Tickets with Hellenic Seaways, ANEK Superfast, Minoan Lines or Sea Jets for ferries sailing from Heraklion to Ios, Mykonos, Paros, Piraeus and Santorini online in advance to enjoy the cheapest available ferry ticket price. The price you see is the price you pay. There are no hidden extras or surprises such as added fuel surcharges or booking fees and we do not charge you anything extra for paying with a Visa Electron card. The price we quote you for your selected Heraklion passenger or car ferry ticket, onboard accommodation and vehicle type is all you will pay, and that's a promise. To obtain a Heraklion ferry ticket price and book your ferry ticket securely online please use the real time ferry booking form on the left. You are also able to add a hotel at your destination, or anywhere else, to your ferry ticket when completing your ferry ticket reservation. The city of Heraklion or Iraklion is considered a most attractive Mediterranean capital with a variety of cultural and commercial events to offer to its residents and international guests. It has always been the business and social centre of Crete throughout its rich history. Heraklion is a city where warm hospitality, rich architecture, culture, leisure conveniences and urban nightlife have successfully intertwined to provide every visitor with a sincere Cretan stay. Visitors can take advantage of the variety of sights they could see and experience in and around the prefecture of Heraklion by investing some quality time with their loved ones and going on a tour, cultural or nature, to see this splendid island of Crete. For the independent visitor who doesn't want structured itineraries, exclusive tours can be arranged to fit their requests or fine car hire can be arranged to ensure a visitor a sound and comfortable ride on the coastal and inland roads. There are daily ferry routes to and from Heraklion Port, connecting it to the port of Piraeus, Santorini and other islands in the Cyclades. Large, modern Minoan Lines and ANEK ships cross to Piraeus, while you can travel to Santorini and the Cyclades by very fast catamaran. Heraklion is the largest city in Crete, located roughly in the centre of the north coast. Heraklion has a population of 131,000 (2001 census), but it is thought that approximately 200,000 people live in Heraklion Municipality and the neighbouring Alikarnassos Municipality today. Heraklion is a modern and lively city steeped in history with numerous archaeological monuments bearing witness to the economic, spiritual and cultural development of past ages. Heraklion consists of the old city locked within the formidable Venetian walls, and the modern part, spreading from without the walls. To tour the old city one can start from the Venetian harbour where yachts and fishing boats now berth or from the Venetian castle of KOULES at the entrance of the old harbour built in the beginning of the fourth century. The archaeological museum is situated on Eleftheria square (freedom square), attracts world interest and houses treasures of unesteemable value of the Minoan age. During the present time the museum is temporarily closed due to renovations being done. Nevertheless the most significant exhibits are based in a specially reformed hall until renovations are complete. There is no official deadline as to when the museum would be ready. The historical museum, is another spot for history addicts, housing treasures and artefacts emanating from Christian, Byzantine, Medieval and contemporary age of Crete, including works by the great painter Dominicus Theotokopoulos (El Greko).The Minoan palaces of Knossos, 5 Km south of Heraklion is one of the most important sites in Greece. Crete has plenty of things to offer to vacationers and travelers who want a fun and exciting getaway by the beach. You and your loved ones will surely have a great time in this stunning island. Heraklion Crete has a beautiful coastline laced with several spots where one can easily enjoy that much longed for swim. Both on the north and south side there are several beaches alongside the turquoise sea water in which one can splash in for exquisite fun. Let us have a look at some of the beaches here. This is located 65km south west of Heraklion. Its clear waters, golden sandy beaches and rocky formations attract many tourists this way. The Agia Pelagia beach is to the north-west of Heraklion. It has a calm sea that is protected from the north-west winds. It is one of the biggest resorts on the north shore and has several fabulous hotels and facilities. This is located 67km south-west of Heraklion, next to Matala. Its main attraction is its long sandy beaches. Amoudara is just 5km from Heraklion town. It has clean organised sandy beaches which make it a really nice and popular spot. 9km east of Heraklion we have Amnissos beach. It contains beach bars and water sports that complement the beautiful long beach which attracts lots of tourists. This is an open relaxed beach located 70km south-west of Heraklion town, next to Matala. Located 33km east of Heraklion, Stalida contains several fine hotels that one would like to settle in albeit for a few days. This is a secluded beach fit for those interested in having a silent getaway. It has beautiful scenery which can be really nice for meditation. This beach is protected from strong winds and contains deep waters making it fit for swimmers. It is 15km north-west of Heraklion town. This is a fantastic beach with lots of facilities to make tourists feel at home. It also has several water sports to offer. Heraklion has a wide variety of beaches to offer each and every category of tourists. From silent isolated locations to crowded exciting beaches, you cannot lack a location to fit your liking. Best Price Guarantee - We always offer you our lowest available Hellenic Seaways, ANEK Superfast, Minoan Lines or Sea Jets passenger and car ferries ticket price to and from Heraklion. There are no hidden extras or surprises such as added fuel surcharges or booking fees and we also we do not charge you anything extra for paying with a Visa Electron card. The price we quote for your selected Heraklion ferry ticket, onboard accommodation and vehicle type is all you will pay, and that's a promise! In the unlikely event you find the same all inclusive Heraklion ferry ticket cheaper in the brochure of any other tour operator we promise that we will do our best to beat that price or offer you the choice of requesting a refund. 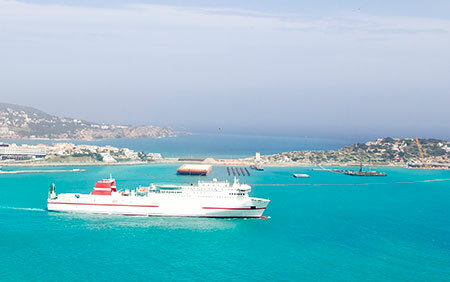 To book Heraklion car and passenger ferry tickets please click here. At ferryto.co.uk you are able to obtain live Heraklion ferry ticket prices, check availability and book car and passenger ferry tickets to and from Heraklion at our lowest available ticket price. Ferryto.co.uk is part of the world's largest online ferry ticket distribution network providing the ability to book over 80 major European ferry operators including to Heraklion and to over 1,200 other ferry routes throughout the UK, France, Spain, Ireland, Holland, Eastern Europe, the Mediterranean, the Baltic and North Africa.